》 Going on holidays? or too busy to cook? Instead of pausing your regular delivery with us why not "Pay it Forward"? Every week, we donate fruit and veg to COPE, a Galway-based charity who work to improve the quality of life of people affected by homelessness, women & children experiencing domestic violence, and older members of our community. 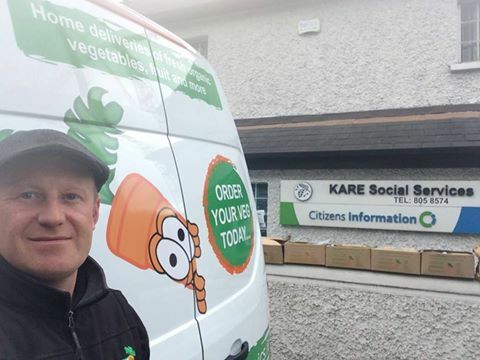 In Dublin, we've partnered with KARE social services – a charity that provide a “Meals on Wheels” delivery service for elderly people, those recovering from an illness or just out of hospital and who are unable to prepare a proper cooked nourishing meal for themselves. Both of these charities do amazing work and our donations are much needed. Box Scheme: If you receive an automatic order from us as part of the box scheme, instead of cancelling your box for the weeks that you are on holiday – why not contact us and ask us to “Pay it Forward” to these charities instead. In addition to your box, we will top up your order with extra farm produce so together we help these wonderful charities provide healthy and nutritious hot meals to those in our society who really need it. Online order: If you order online, why not change the “Shipping Address” of your next order to CHARITY and we will deliver that order in full to COPE in Galway or Meals on Wheels in Dublin – and we will also top it up with additional produce from the farm. By taking part in this “Pay it Forward” initiative, it really helps us out, helps out the charities and you also get to be part of something bigger that is really worthwhile. This small gesture can make a BIG difference in the lives of those who really need our help.